Like many accomplished artists, David Mamet has continually reinvented himself—as playwright, director, screenwriter, essayist, novelist, poet and more—but through it all, the one label he hasn't been able to shake is that of misogynist. On the surface, this seems a convenient descriptor for a guy whose bread and butter is macho characters suffused with profane language and sexist attitudes, yet we all know this manner of knee-jerk labeling doesn't hold up—artists are no more what they write or depict than doctors are the diseases they treat; to hold up a mirror to society is not to be the image in the glass. Anyone who has ever produced or written a movie about the Holocaust would serve as a perfect example of this. Still, after Sexual Perversity in Chicago, American Buffalo, Glengarry Glen Ross, Speed-the-Plow, Oleanna, and the rest, even a team of Johnny Cochran, Jerry Spence, and Walter Gerash would have trouble getting Mamet off the hook as a chauvinist pig. 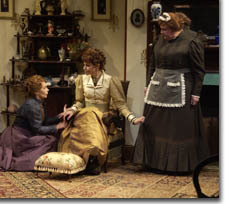 Yet in Boston Marriage, now receiving its regional premiere by the Denver Center Theatre Company, Mamet's dialogue speaks for itself, and in doing so makes a strong case that there is more to him than has previously met the ear. 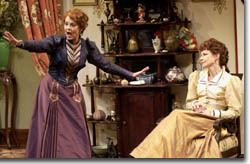 His play takes its name from a term for a lesbian relationship, apparently coined by Henry James in his novel The Bostonians, and is set in an exquisitely appointed drawing room in that most proper of New England cities at the end of 19th Century, during the waning decades of Victorian sensibilities. The outspoken and demonstrative Anna, and her measured and thoughtful friend, Claire, weather the trials of secret love at a time when the price to pay for discovery was devastating. Annette Helde employs Mamet's razor sharp language to withering effect in her alternately edgy, bitter, flighty, and jealous portrayal. Her Anna survives by her wits, manipulating "benefactors" to maintain her refined lifestyle, and provide a façade for her other life. Robin Moseley, as Claire, revels as well in the playwright's rich, witty verbiage, offering up a wry, understated, but nevertheless, skewering counterpoint to Helde's Anna. Unwilling to participate in the duplicitous ruse of stringing along a male sponsor for appearance's sake, Moseley's Claire lights up the theatre with her delicious, new-found, forbidden passion. 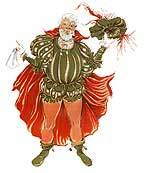 If Mamet falters at all, it is with the elliptical and repetitive utterances of the maid, Catherine. Yet here, the inestimable timing and body language of Katherine Brady consistently turn what could have been witless intrusions into comic relief. Director David McClendon's staging is both economical and emotionally satisfying; his use of the set to incorporate off-stage business into on-stage action makes the cast of three feel twice its size. The craft work, highlighted by Lisa M. Orzolek's set and Kevin Copenhaver's costumes, is lavish. Above all, Mamet expands his own emotional, linguistic, and intellectual range, rewarding our willingness to consider his new direction with a meaningful and enriching experience. 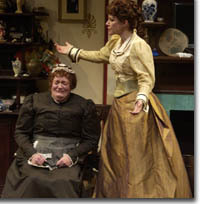 The Denver Center Theatre Company's production of Boston Marriage runs through December 23rd. 303-893-4100.